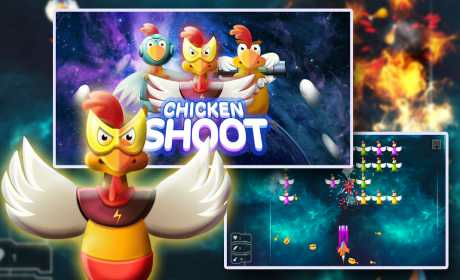 Chicken Shoot space is a fun shooter game for all gamers and for all ages. Chicken shoot release pretty long introduction on the computer, has now been enhanced with new exclusive features. The task is shoot the alien chick to collect weapons, property and protect yourself. The chicken from the galaxy have a devious plan to take over the earth. They want to revenge for their species from earth. The human has used the chicken for centuries. They try to invade the earth by sending war ship. As a hero, you mission is to stop the space invader. 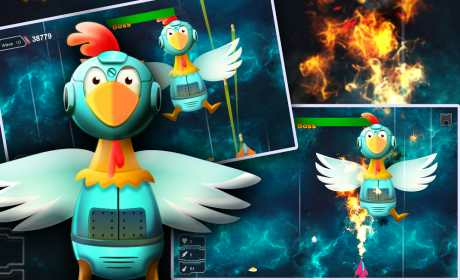 Chicken Shooter have multiple modes and levels of play to choose from, but even in the game in any way, your mission is to kill chickens have increasingly more dangerous and cunning. You’ll be upgrading weapons after receiving the swirl symbol change color or choice of weapons, get Boss, asteroids, comets, or gift rewards barrel after each screen. Chicken species were constantly laying eggs bombs and you have to stay away from them because they will make you explode. You can choose from different kind of spaceship in Chicken Shoot game. Your mission is to fight with those invaders in Chicken Shot game. You just need to take all them down, be the best shooter, kill all of them. On the way, you can collect ammo, missile to shoot the space invader to end the invasion. You can collect money too to upgrade your ship or have yourself a burger when galaxy war end. You can collect some chicken meet too. Collect them enough to have extra life. Collect gift box for gun. Have fun Chicken shoot of the galaxy. Sometime in the near future, Earth will be invaded by chickens from another galaxy who are bent on revenge against the human race for oppressing Earth chickens. Take the world’s fate in your hands (or at least have an omelette) in this modern rendition of the ’80s classic. 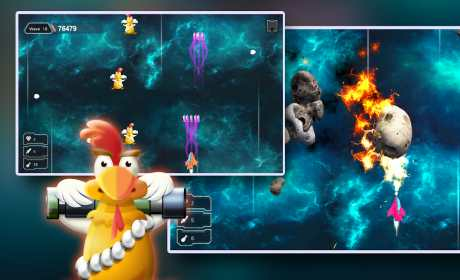 Chicken Shooter is a strange new twist on the classic Space Invaders style arcade game. Chickens are invading Earth and it’s your job to pilot a spaceship to take them out and save the world. You’ll take on increasingly difficult waves of chickens and asteroids that threaten to destroy Earth. Good graphics and sounds add an interesting touch to the good arcade gameplay. The gameplay at the heart of Chicken Shot is very similar to other arcade shooters. You control a spaceship at the bottom of the screen that can be moved left or right. The enemies sit at the top of the screen, and its your job to eliminate them. However, you’ll have to be quick and alert to dodge the eggs they drop. If you get hit by an egg, you lose one of your three lives. When destroyed, the chickens drop a drumstick you can collect for bonus points, or a present that will award you powerups and points. You repeat your actions on wave after wave until you finally lose all three lives and the game ends. Now… Become to Chicken Shooter and shot now….